Toopy and Binoo: Fun and Games live show is coming to MacDonald Island Park this September! On September 28, Suncor Community Leisure Centre at MacDonald Island Park will host two shows for local fans of the popular children’s television series Toopy & Binoo. In this new show, the dynamic duo perfectly blends optimism, imagination, and spontaneity in their quest to find the best game ever! The story unfolds as a toy chest full of mismatched game and puzzle ignites a curious imagination: watch as Toopy and Binoo dance with X’s and O’s; wiggle with smiling snakes; try to outwit a gang of dancing ladders. Along with tea-partying cats, energetic Dusteroo’s and fun-loving sheep, Toopy and Binoo embark on their wackiest and most interactive adventure yet! Entertaining and unpredictable, Toopy and Binoo: Fun and Games integrates music, theatre, dance, puppetry and innovative multimedia technology to create an off-the-wall experience that will delight the entire family! 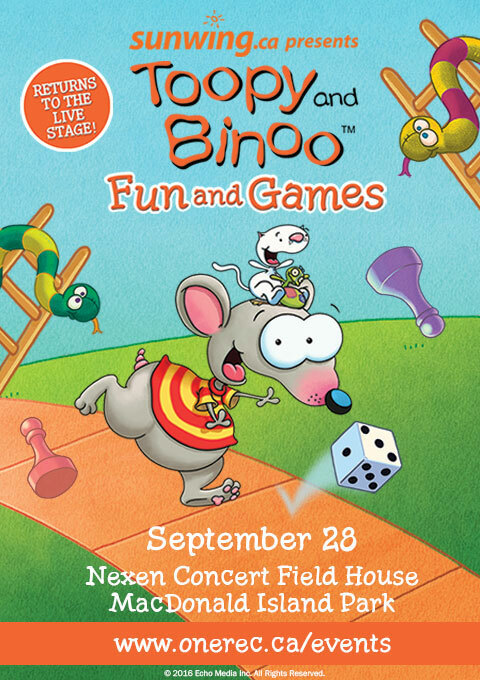 Show times at CNOOC Nexen Concert Fieldhouse on Wednesday September 28 for Toopy and Binoo: Fun and Games are 3:30pm and 6:30pm.